I don't know about you, but Spring always has me thinking SUMMER. Which leads me to putting the boys back into swim lessons - because we spend so much of our summer between the beach and pools. The Bug Guy is now 7 and the twins are nearly 6. They have had swim lessons since the age of 3 and I hate to say that they still can not really swim. Not the way I want them to. I started the Big Guy one summer at an outdoor pool, but that didn't go so well between the cold air and his cerebral palsy. His muscles got too tight and it was heartbreaking to watch. 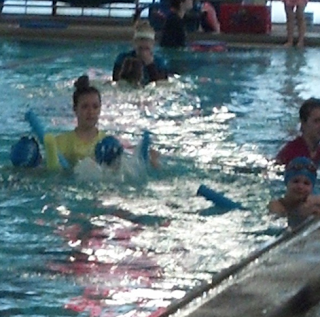 From there we switched over to the YMCA for the heated pool. While I love the Y, the lessons went from 6 kids in a class to 12 kids in a class and there never seemed to be any specialized instruction for the kids who needed a little something more. And while it seemed fun for the kids at first to be using the bubbles, they didn't ever seem to move away from using those bubbles. It became like a crutch for them. I felt like I knew they could do it without the bubble, but they didn't know it and they didn't have the confidence to try without it. 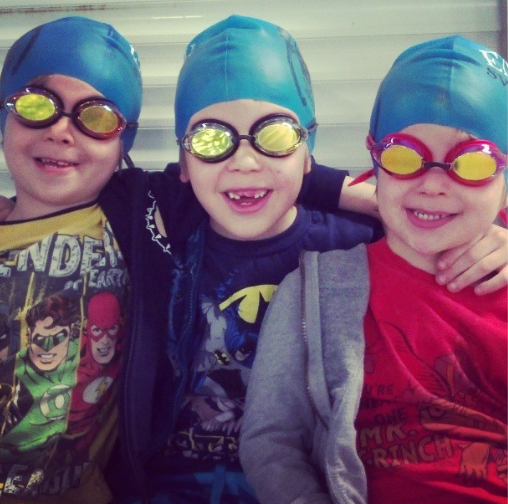 We were given the opportunity a few weeks ago to enroll all three boys at﻿ Envious Swimming -Rhode Island's premier swim school. 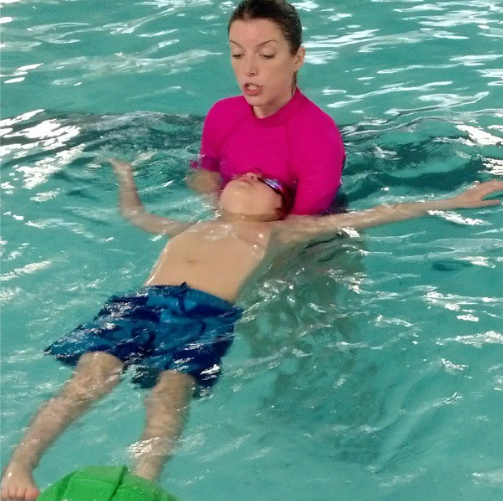 They have over 700 swimmers between their Learn To Swim program and their Swim Team, and they operate out of two locations: Bryant University in Smithfield and McDermott Pool in Warwick. 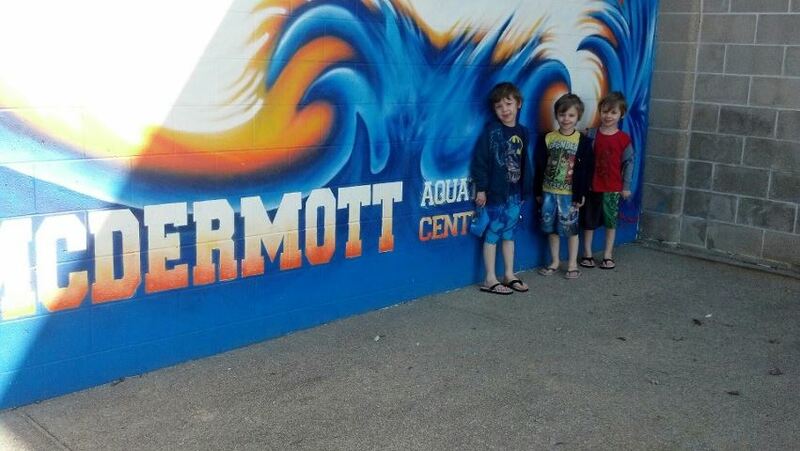 We chose McDermott Pool since it was closer to us. 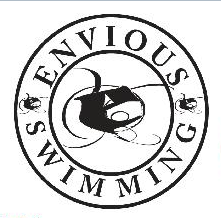 Envious starts their program for swimmers at 6 months of age but also caters to adults. Their classes run in a 1 instructor to 4 swimmer ratio and all classes are 30 min in length. That was just amazing to me. Having three kids start at the same level, it was just the three of them. Their own private lesson! 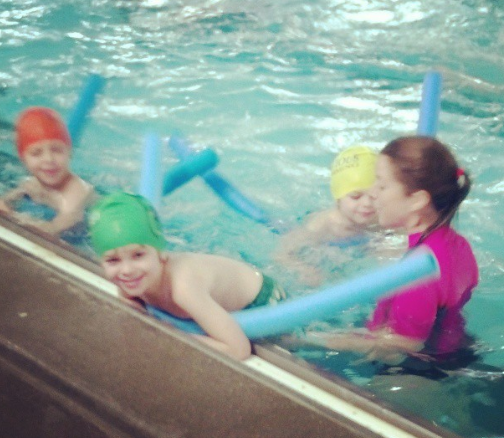 They have never received such attention in a swim class before. This is the Big Guy. Floating almost on his own. I can not express to y'all how huge this is for him. 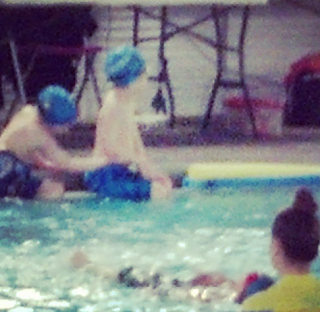 He has gotten stronger through physical therapy in the pool (once a month) but he couldn't do this then either. Just amazing. The boys always liked getting in the water, but they have such a great time at Envious I am smiling the entire time watching them smile. Something else the boys love? Swim lessons end with getting to pick out a small prize for working so hard in the pool. A little extra motivation at the end for the kids. They also have stamps and stickers on hand as well. I cannot get enough of the swim cap and goggle look. At the completion of their 3 lessons, the Big Guy was actually moved ahead a class from his brothers. I can not even begin to explain what a big deal that is... or how much confidence he gained from that. In addition to their website, you can follow Envious on Facebook, Twitter and Pinterest. Envious is a proud partner of Make a Splash, the official water safety initiative of USA Swimming. Here they are at their lesson last week. Four to a class maximum is awesome! Even more awesome? The Big Guy happens to currently be in his own class. He is on the left of this photo with his instructor. And the twins? It's just the two of them as you can see at the center. I can not say enough about these swim lessons. Let me know if you check out Envious. I think you will love them too! They boys have all made such strides in just one month's time that I think we will be staying at Envious for good. What a perfect post/review/endorsement of Envious! As you know, the Couto/McClelland family is BIG on swimming and I so personally know the confidence, health, amazement of swimming and kids' knowing HOW to swim. I, too, love Envious and I love, love, love your boys' experience and your Mom message. Thanks for sharing! We have been taking Hayley to envious since she was 8 months old. Marshall and Jill are incredible and the program they started in second to none. Zane is now enrolled and started a few weeks ago. So, in the past 4 years, I have been going once a week and each week they have so much fun and love it! And guess what, Hayley at 3 years of age, could swim. Now at 4.5, she is a fantastic swimmer and is swimming in the deep end. I love their program so much! I am really excited to bring Benjamin, although I am a little worried about taking him by myself the next 2 weeks (no Daddy reinforcements since he'll be away for work!). He freaks out when he gets his head wet, so I am not sure how it is going to go. Please wish me luck. Although from what I hear, Envious is fantastic, so I think we'll be in good hands! I learned to swim at McDermott Pool when I was a kid. 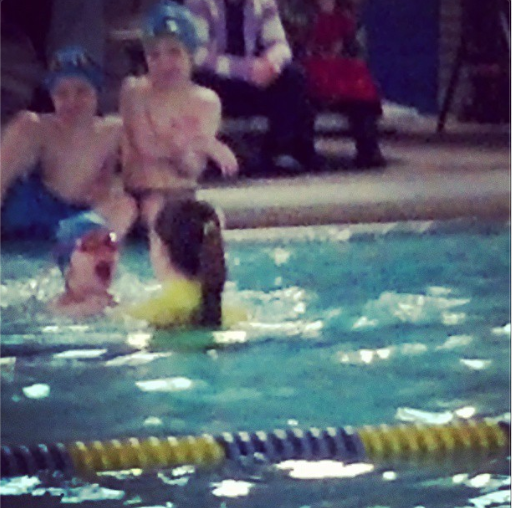 My kids need to go back to swim lessons. 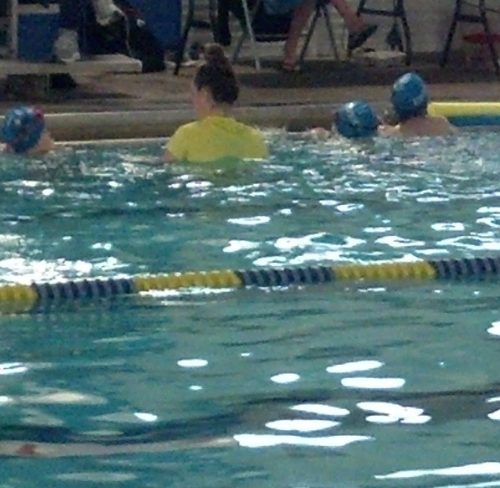 I had the experience at the Y - my girls still use the bubble. 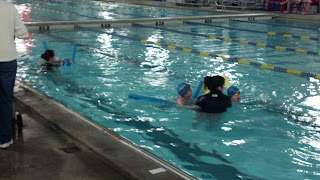 We have been discussing swimming lessons again that will actually teach them how to swim on their own. Will definitely have to visit envious before summer! So awesome. 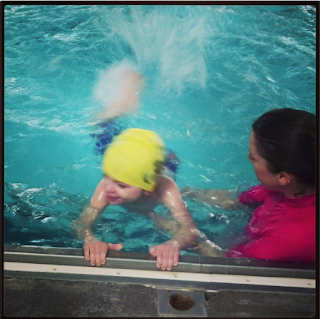 I love watching kids learn to swim the right way- NO BUBBLES!!! Great program! Awesome!!! I can only imagine the smile on your face when the big guy got promoted. That made me smile! Love the pics! Swim lessons are so important- thanks for the tips, never heard of this place, looks great! What a great swimmer you have! This program sounds wonderful! The boys look adorable in their goggles and swim caps! Your description of the Y classes are the exact reason we didn't start my girl there. We wanted "more" we swim exclusively with PODS but have heard good things from friends who swim with envious!